Katrina chose not to reveal her face. So here’s a glimpse of her boots! Old rusty cars, dust-covered abandoned furniture, dilapidated buildings reeking of forgotten memories, are not the traditional subject matters that photographers tend to veer towards. But 38-year-old Katrina has always tried to swim against the tide. Growing up in a small rural farming town of Australia, the comfort of normalcy and familiarity irked her young, curious mind. And, she would often find herself pondering about what lay beyond the immediate confines of her home town. 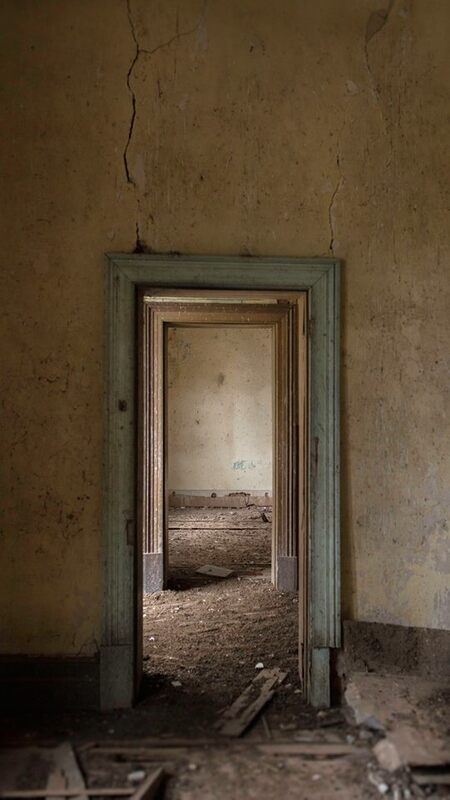 Her fervent interest in the unknown and unexplored sparked in Katrina a fascination for old, abandoned buildings and new places and an urge to capture them with her camera. In conversation with TAL, the unconventional photographer speaks about her need to “escape” the familiar, the story and thought process behind the composition of her photographs, and the challenges she faced in her journey. When did this fascination with abandoned building and unexplored places begin? Growing up in a small and rural farming town I found myself developing an interest in travelling to exotic and forbidden places. In retrospect, I was always trying to "escape". I wanted to explore the jungles of Papua New Guinea, strange and isolated countries like North Korea and the wilderness of Greenland. I wanted to be anywhere but the repetitive and dreary surrounds of Temora, my home town. It was a meat and three veg kind of town. Most people had not left the state let alone the country. The most exotic thing about Temora was the local Chinese takeaway, serving fried rice on a Friday or Saturday night. As a child, I craved something different. I did not know what it was, but I knew there had to be more! I would spend hours exploring my surroundings, disused junkyards, abandoned houses, farm sheds or the drain ways of the local town; it was by far my favourite past time. Most of your photographs are so unique, almost melancholic. What are the elements of an object or a place that attracts you to it as a photographer? I've always been drawn to the macabre aspects of life. The small, exquisite details in something not typically seen as 'beautiful'. I'm attracted to the little features of life - things that go unrecognised. Everything has an element of beauty, you just need to pay attention; whether it’s the richness of the pigment in a rusty can or the way dust falls on objects that have sat untouched for decades. How do you decide on what picture to take, and what’s the entire process like – from finding the inspiration to publishing? It depends on the subject; but mostly it's a gut instinct, an urge. When I arrive at a location – an abandoned building- I usually walk a lap outside, surveying the building’s condition and noting objects that attract my attention. Primarily, I look for the light – where is it, how is it falling on the said object, how strong it is. When I photograph within abandoned buildings I never "stage" scenes. Some photographers will "stage" photos – place/move objects from their original place to create a beautiful composition. I look for striking compositions that already exist within the space. When I have decided on a subject to photograph, I will take several pictures at different apertures and from very slightly different angles and distances. I rarely visit the same building twice, so I like to ensure I get it right the first time. For most of my work, I use a Canon 6d with a 35mm prime lens which is excellent for small interior photographs and street photography. I also have a Canon 85mm prime lens, but it doesn't come out much these days. Did photography always interest you as a kid? And, what prompted you to become a photographer yourself? As a child, I loved looking at images from around the globe in National Geographic magazines. The exotic locations and people drew me in instantly as they were a stark contrast to my immediate living surroundings. My father gave me his old Pentax Spotmatic SLR when I was 11, and I was hooked! I would sit for hours with my father's globe and trace the peaks and troughs of exotic lands with my finger, dreaming of working for National Geographic. The idea of travelling and exploring small unseen pockets of the world excited me. As a young teenager, I developed a love for music and discovered the profession of 'music photographer' – a realisation that excited me to no end! I would see images of Rock and Roll stars shot by Australian photographer Tony Mott and think, "I have to do that!" As I grew older, I became interested in photojournalism. I remember seeing images of famine-stricken Sudan and Ethiopia during the '80s and '90s and being inspired by the works of those who brought these catastrophic events to light through their photographs. Which photographers have influenced and inspired you and why? There have been so many over the years! Images of famine and civil war raging within Sudan during the 80's shot by Kevin Carter have stayed with me. In the early days, I was drawn to world correspondent photojournalism and admired those who covered critical historical events like the Kosovo war. I also love the work of Australian photojournalist Andrew Quilty. He is living in Afghanistan and produces stunning images of everyday life of Afghani people. Muhammed Muheisen, an Israeli born photojournalist, is probably the photographer I am most inspired by till date. He recently covered the life of Afghani refugees living in the slums of Pakistan, and the vibrant colours and the range of tone of his photographs were awe inspiring. Do any other genre of photography like landscape or portraiture excite you? I've never really been drawn to landscape photography myself but really admire landscape photographer Julie Fletcher. I would like to explore more portraiture photography but finding subjects is more difficult than finding abandoned buildings. What kind of challenges have you faced in your journey as a photographer? My greatest challenge has been not to compare myself to other photographers, and to find my own style rather than emulate others. Also, photography can be an expensive hobby with some cameras and lenses reaching up to $14,000. Considering most of your images are eccentric, what has the reception been like to your work? It's mixed! I got a lot of love for my recent pictures on the rodeos across South Australia. But, concerning my abandoned building photography, I often get the occasional, "why do you photograph things like that?" questions. To be honest, it is quite interesting to see what people do and don't like. Connect with Katrina on Instagram. Disclaimer: The photographer sought permission before photographing the abandoned buildings depicted.